Violinist Teresa Wang is a passionate musician who loves sharing her art and ideas with the world. She enjoys performing in solo, chamber, and orchestral settings, and has been the concertmaster of the Academy Chamber Orchestra, Toronto Symphony Youth Orchestra, McGill Symphony Orchestra, and National Youth Orchestra of Canada. Ms. Wang has performed as a soloist with the Academy Chamber Orchestra and Toronto Symphony Youth Orchestra, and she was recently named the winner of Jeunesses Musicales Canada’s 2018 Peter Mendell Award. As an avid chamber musician, Ms. Wang has collaborated with artists such as Martin Beaver, Stéphane Lemelin, Douglas McNabney, John Novacek, Eric Nowlin, and Scott St. John. 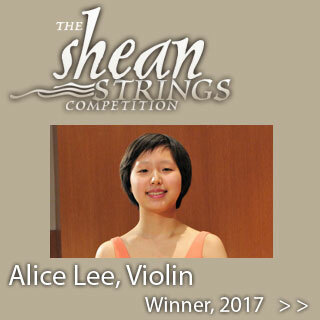 She has appeared as a fellow at the Toronto Summer Music Festival, Manchester Music Festival, and National Youth Orchestra of Canada. After winning McGill’s 2017/18 Chamber Music Competition with the Z4 Quartet, her ensemble pursued residencies at Beijing’s Central Conservatory of Music and the Lunenburg Academy. Ms. Wang studied for many years at the Glenn Gould School’s Young Artists Performance Academy, and is currently completing her Master of Music at McGill University, studying with Axel Strauss.